Would be president and religious loon Ted Cruz crashed out of the race for the Republican nomination last night after being crushed in the Indiana primary. It’s the end of a difficult run for Cruz who’s been criticised for his hard right stance and bizarre campaign decisions however last night the bumbling politician managed to mess up one final time. 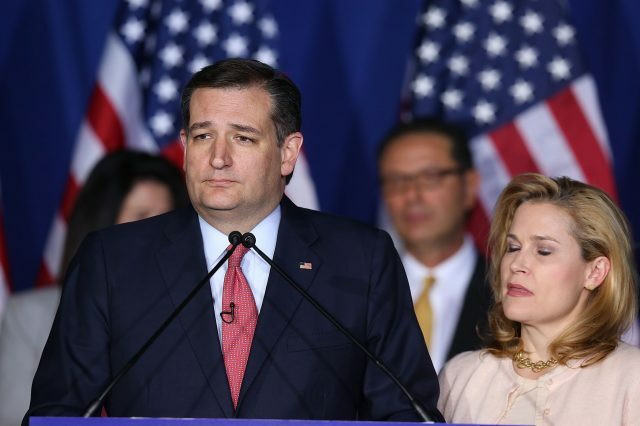 During his concession speech Cruz managed to accidentally punch, then elbow his wife, Heidi Cruz, in the face after he finished speaking. From the beginning, I’ve said I would carry on as long as there was a viable path to victory. Tonight, I’m sorry to say, it appears that path has been foreclosed. Together, we left it all on the field in Indiana. We gave it everything we’ve got. But the voters chose another path. And so, with a heavy heart, but with boundless optimism for the long term future of our nation, we are suspending our campaign. But hear me now, I am not suspending our fight for liberty. Cruz decision to drop out also basically guarantees that Donald Trump will be the Republican party’s nominee for the November 8 presidential election.